1st Time Cover Flow experience in BlackBerry. 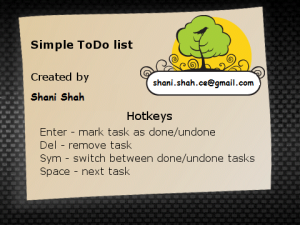 Task todo manager to manage personal tasks and todo lists. It grew out of my frustration that well-known task managers, such as those provided with Outlook or Lotus Notes, do not provide facilities for composite tasks. Often, tasks and other things todo consist of several activities. Task Todo makes your life easier and take the stress out of managing multiple task lists in several places. Easily create and manage your to-dos for presentations, meetings, ordering, etc. * Create as many tasks as you need per project. * User Friendly , Very Nice GUI , Animation , Highlight required information. * Different Screen track for already completed task. * Store details can include sorted by priority of task, Re-open completed task , Remove task. * Simple seamless interface for common day-to-day project tasks at home, work, special events, or school. * Easily usable by all age groups. And Many More. Now its on promotion, it will be have different high price rate. Bump up the gay travel fun on your trip to Miami! The team behind Bump!